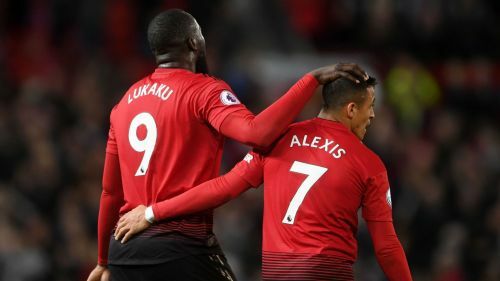 Ole Gunnar Solskjaer has urged Romelu Lukaku and Alexis Sanchez to seize their opportunities, with the Manchester United pair likely to be given further chances to impress amid an injury crisis. Both Lukaku and Sanchez have fallen out of favour at Old Trafford under interim boss Solskjaer, who has preferred the speed of Jesse Lingard, Anthony Martial and Marcus Rashford in his front three. But that trio have all suffered injuries in recent weeks and only Rashford is in contention to face Crystal Palace on Wednesday, although he is yet to be assessed for an ankle ailment. Lukaku started and impressed in a goalless draw against Liverpool at the weekend, while Sanchez came off the bench, and Solskjaer acknowledges that the duo will now have further chances to star. "It is a chance for them to play to their potential," the manager told a pre-match news conference. "Reputation is one thing but their potential is high. "The two of them are good mates, they link up well together, so this might be a chance for them together to find some form and give us a selection headache for when everyone is fit again. "[The opportunity] has been coming – Rom created our two biggest chances against Liverpool. It is a different position for him, I know, because Rashy's injury meant we had to rely on him standing up there and running in behind. He couldn't do too much defending. "Rom's attitude and work rate was fantastic and the two chances - Jesse's and Chris [Smalling] at the end - were Rom's doing. Hopefully Alexis and Rom can step up."